Learn how to play Caribbean Stud Poker, an incredibly popular poker variation that is not only available at most of our partners’ sites, but you can also claim some juicy bonuses to boost your bankroll when playing against the house. This poker variation is very similar to Five Card Stud, and the only real difference between classic five card poker games and Caribbean Stud is that you do not play against other players; only the dealer representing the house. Players are dealt five cards and must decide whether to play stronger hands against the dealer by calling, or to fold weaker hands if they believe that it doesn’t compete with what the dealer has. Keep reading to find out more about the rules of this simple and exciting casino classic. The game of Caribbean Stud Poker begins with players placing ante bets. All the players and the dealer receive five cards facedown. Players can also choose to place an optional $1 progressive side bet. To call another player place a bet two times the size of the original ante bet must be made if the player wishes to continue their hand. If the player decides to call and compete against the dealer's hand, all cards are exposed and there is a showdown between the dealer's hand and the player's hand. Surrendering their ante and folding their cards. Dealer does not qualify: Player's ante bet is paid 1:1. Dealer qualifies and beats the player: Player loses both their ante and call bets. Dealer qualifies and loses to the player: Player's ante bet is paid 1:1 and player's call bet is paid out according to standard payouts per hand. Your payout not only depends on which scenario occurs, but it also depends on the hand you win with. We will cover the standard payouts per hand in the following section. Almost all Caribbean Stud Poker games provide a chance of hitting a large progressive jackpot by placing a small optional side-bet that was mentioned earlier on. These jackpots can be small or large depending on the popularity of the casino room or game itself. While you may now how much you can win with each hand, the next question to cover is how you can win at Caribbean Stud Poker; and in the next section we’ll tell you how! 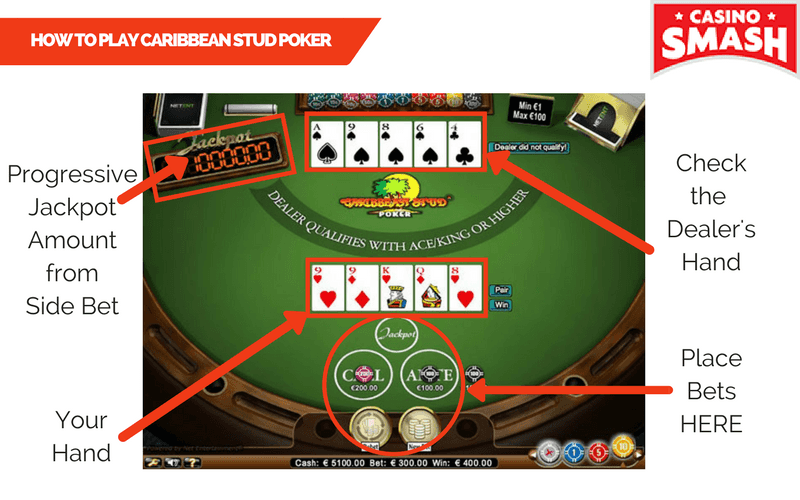 Learning to play Caribbean Stud Poker is quite easy with only a few strategy guidelines to keep in mind. The optimal strategy is for the player to call any pair or better and fold anything less than Ace/King. Raise on A-K-Q and A-K-J if the dealer shows an Ace or a King as their exposed card. When a player holds A-K the dealer's chances of collecting a high pair are reduced and the player’s A-K is most likely to turn out as the best hand. The hands A-K-Q and A-K-J should also be raised if the dealer shows any card from 2 to 5. In this case your Ace-King will most likely be the best hand. The hand A-K should be raised if the dealer receives anything from 2 to Q as their open card and the player has also has the same card. Most of the time players will either be dealt nothing or a pair, so it is important to take advantage of reasonable cards when the opportunity arises. While two pair and three of a kind can also be common, they still don't appear often enough to cause any real concern about the dealer's hand. Another thing to be prepared for in Caribbean Stud Poker is that a lot of dealer's hands will not qualify! If you want to test your luck at this popular casino card game, we recommend the following list online casinos to play Caribbean Stud online for real money or even for free. You can also collect some exclusive bonuses to play if you click on any of the links listed below!